BMW Group India has rolled out the facelifted version of its executive class sedan BMW 5 Series in the country and it is available in a total of four trim levels among which, this BMW 5 Series 525d Luxury Line is the mid range diesel trim. This variant is powered with a highly acclaimed 2.0-litre turbo charged diesel mill that delivers an impressive performance. The company is offering this variant with its Luxury line styling aspects that beautifies the vehicle both inside as well as the exteriors. Also, this mid range diesel version is incorporated with sophisticated BMW ConnectDrive features along with several other BMW EfficientDynamic functions that represents the technological advancements achieved by BMW in the automobile segment. The company claims that this particular trim in its model series is rather powerful as it can produce 218bhp of peak power at 4400rpm and generates a mammoth 450Nm of torque at 1500 to 2500rpm. On the other hand, this turbocharged diesel mill allows this premium sedan to zoom towards a 100 Kmph speed in just a matter of 6.9 seconds. This facelifted version comes with minor tweaks for both the interiors as well as outside, which is making it look quite alluring. Its front facade is blessed with a revamped headlight cluster and redesigned bumper that makes it more desirable. This facelifted version will now compete with its German rival Mercedes Benz and others in the luxury car segment of India. As said above, the facelifted version of the BMW 5 Series executive sedan has received some major tweaks, especially at its front and rear profiles. Starting with its frontage, this model received a revamped headlight cluster that looks sleek, stylish and very expressive. In the center, there is a chrome plated signature BMW Kidney Bean shaped grille and it is complimented by the company logo fitted just above it. The bottom of the front facade is fitted with a body colored bumper that has been designed with a large air dam that has a pair of fog lamps integrated in them. The front profile is further enhanced by the chrome garnished strips decorated on to the air ducts. Coming to the side profile, this BMW 5 Series 525d Luxury Line trim is blessed with a classy set of 18 inch multi-spoke light alloy wheels , body colored door handles and ORVMs. The window sills have been accentuated with chrome accents. The rear profile of this luxury sedan received minor tweaks where, its taillight cluster has been improved along with the design of the bumper. The bumper has been incorporated with reflectors along with a horizontal chrome accentuated strip. Inside the cabin, this mid range trim is blessed with lavish aspects that makes the interiors look elegant. The seats inside the cabin have been covered with premium Dakota leather upholstery with exclusive stitching. Also the sleek and stylish dashboard in the front row gets 'fine wood' trim Anthracite finishing, which will surely offer a luxurious feel to the occupants. Apart from all these, this particular sedan gets some top of the line equipments including BMW ConnectDrive aspects such as BMW Live, BMW Apps, Audio Operation at the rear, Harman Kardon Surround Sound system that is incorporated to the 25.9cm color display, iDrive with touch controller and several other advanced functions. One should talk about the interior space, where the leg room and shoulder space is ample, which will never let the passengers experience any sort of discomfort. The company has incorporated various utility based features including sporty leather steering wheel with gearshift paddles, floor mats in Velour, electrical glass roof, roller sun blinds for rear windows and various other exciting functions. The facelifted version of the BMW 5 Series 525d Luxury Line trim is powered with a 2.0-litre turbocharged diesel engine , which is more powerful. However, this engine has been designed with 4-cylinders and 16-valves that makes a total displacement capacity of about 1995cc. This turbocharged diesel mill can produce a maximum 218bhp of power at 4400rpm, while generating a maximum torque output of about 450Nm in the range of 1500 to 2500rpm, which is incredible for a 2.0-litre engine. On the other hand, the company has equipped this particular engine with an advanced 8-Speed Sports Automatic transmission gearbox that delivers the engine power to the rear wheels and allows this sedan to obtain 100 Kmph speed mark in just about 6.9 seconds . On the other hand, this diesel engine comes with a best in class fuel efficiency of about 17.09 Kmpl, which is quite remarkable. Coming to the braking aspects, all four wheels of this sedan have been fitted with disc brakes that are highly reliable in all conditions. These disc brakes will get the assistance from an advanced anti-lock braking system along with cornering braking control system that averts the locking of wheels when sudden brakes are applied. This will reduce the risk of skidding and improves the drive quality. Furthermore, this variant is incorporated with an advanced power steering system that produces its best in sharp curves and improves the handling aspects. The facelifted BMW 5 Series 525d Luxury Line trim is mid range trim in its model series, but it comes with executive class interiors incorporated with lavish comfort features. The company is offering this trim with a lengthy list of features including an automatic air conditioner with 2-Zone control, ambient light, electrical sun roof, power steering, lumbar support for front passenger and driver seat, electrical seat adjustment with memory function, an automatic start/stop function are just to name a few. The company is also offering its sophisticated BMW ConnectDrive functions including iDrive with 25.9cm color display incorporated with professional navigation system, park distance control for front and rear, rear view camera, multi instrumental display, advanced Harman Kardon Surround System with audio controls mounted on steering wheel and various other luxurious aspects. 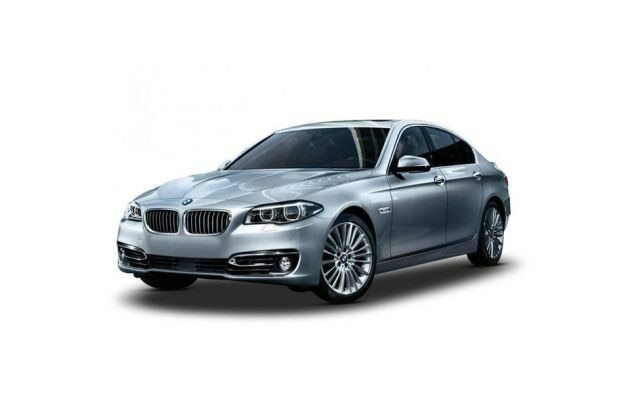 BMW has never compromised on the safety aspects of any of its models including this BMW 5 Series model. The company blessed this trim with state-of-the-art protective functions including an Active Protection system including Attentiveness Assistant, Anti lock-braking system, Dynamic stability control , side impact protection, electronic vehicle immobilizer and crash sensor along with several other sophisticated functions. Pros : Striking appearance, plush interiors with impressive features. Cons : Price tag can be more competitive, fuel efficiency can be improved.